Make it a Day On… Not a Day Off! During the 1950s and ’60s, civil rights leader Martin Luther King, Jr. recognized the power of service to strengthen communities and achieve common goals. Initiated by Congress in 1994, King Day of Service builds on that that legacy by transforming the federal holiday honoring Dr. King into a national day of community service grounded in his teachings of nonviolence and social justice. The aim is to make the holiday a day ON, where people of all ages and backgrounds come together to improve lives, bridge social barriers, and move our nation closer to the “Beloved Community” that Dr. King envisioned. 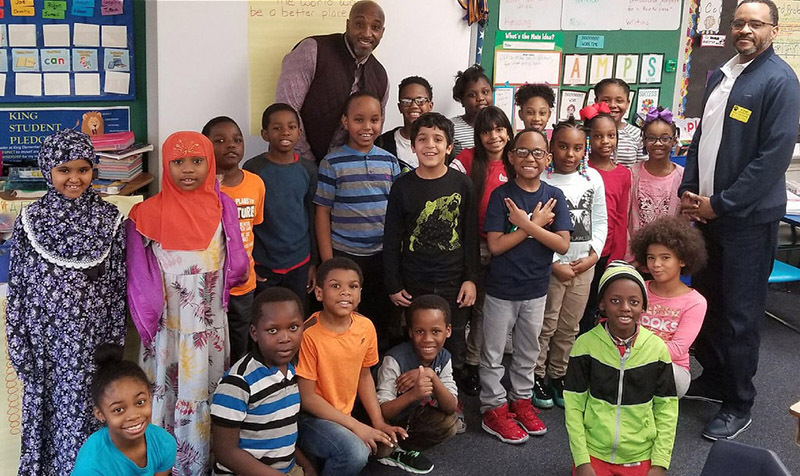 Talk to children about Martin Luther King’s dream and the fact that one man managed to help change a whole country. Ask children what they think is unfair, and what they think they can do to change it. If they could change big things in the world, what would they be? Have children trace the outline of their hands on a variety of construction paper in different rainbow colors. Have them cut out each hand shape and then glue them onto the poster board. Now brainstorm things that the children believe need change in the world–and ways that they and your program can help. Few individuals will get the chance to speak before thousands of people at the Lincoln Memorial like Martin Luther King, Jr., but there are things your program can do to make a difference! Perhaps it’s collecting cans for a local food bank to help the hungry, or running a car wash to raise money for the homeless. Maybe it’s bringing entertainment to cancer patients at a local hospital or sending care packages to soldiers abroad. On each hand, write one thing that each child dreams of changing, such as Hunger or Homelessnes; next write a few sentences about what they can do to help. 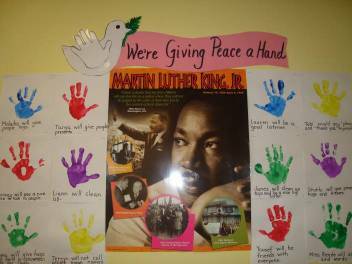 Not only will this project children thinking about Martin Luther King, Jr., but it will encourage them to explore what they can do to make the world a better place. It’s never too young to start making a difference. KEEP THE POSTER UP ALL YEAR AND MAKE IT A PERMANENT PART OF YOUR CLASSROOM/PROGRAM! Children will enjoy creating this craft which demonstrates that people of all colors are part of one family. Even more fun than making your pin is wearing it on Martin Luther King Jr. Day. 1. Cut six one-inch pieces of yarn from each of the three colors of yarn. 2. Use one end of the toothpick to rub glue inside the hole in each of the three beads. 3. Use the other end of the toothpick to push the ends of one of the colors of yarn into the hole of each bead for hair. 4. Glue two wiggle eyes to the side of each bead, below the yarn hair. 5. Glue a pom-pom to the side of each bead below the eyes for the nose. 6. Use the red marker to draw a mouth on each bead below the nose. 7. Glue the three beads together. 8.Glue the pin-back to the back of the beads. If you do this project on a Styrofoam plate or tray you will not have trouble with glue or paint sticking to the surface as it dries. If you are helping a younger child make this pin you might want to use slightly larger beads to make it easier to work on. Write on a chart some of the “dreams” that Martin Luther King expressed in his speech. 1. Martin Luther had a dream. What are the children’s dreams? Explore this by having them draw a picture of themselves representing what they want to be/do as adults! 2. Put the individual squares together and tie them with yarn. 3. Put a plain colored border around the quilt and as a fill in where needed. 4. Put a title above the Quilt: “I Have a Dream” or “When I Grow Up”…The title will depend on the age of the group of children. Make the classic paper chains using black, white, red, yellow, and brown construction paper to represent the various skin tones found across our nation. A variation on this theme: Children can trace their own hands, then color them in using different skin-tone shaded crayons. You Need: Paper Plates, Streamers, Glitter, Paint and Markers Have children draw peace signs on the paper plates… decorate them with with paint and glitter. Tape or glue steamers from the peace signs. Hang about room! 1. Cut a large cloud shape out of a piece of card stock. If you are using construction paper cut two of the same shape and size and glue them together so they are strong enough to hold your mobile. Your cloud needs to be long enough to hand three or four smaller clouds from it. 2. Cut out three or four smaller cloud shapes. These can be different colors and even different shapes. You don’t have to use clouds – they can be circles, squares, hands or whatever you like. 3. On the large cloud write the words “I have a dream” on both sides. Decorate however you like. You can use stickers, glitter or draw a picture or a rainbow on your cloud. Decorate both sides. Now punch two holes evenly spaced across the top. Cut a piece of yarn about a foot long and tie an end in each hole. This is how you will hang your mobile. 4. On the smaller clouds, write what your dreams are. Do you want to be a doctor? Would you like everyone to be happy? Do you want to own a puppy? Your dreams can be big ones or small ones – they are yours and that is what makes them special. Again, decorate each cloud however you would like it to look. 5. Now punch a hole for each cloud along the bottom of the larger cloud – spacing them out evenly. Then punch a hole in the top of each little cloud. Cut a piece of string to go with each cloud, making them different lengths. Tie one end of the string in the bottom of the large cloud and the other end in the top of a small cloud. Repeat until you have all your shapes hanging from the larger cloud. Hang your “I have a dream” mobile where you can share your dreams with others. Give each child a piece of paper and cut a cloud shape from it. Have them paint the cloud and then ask them their dreams… Write them on the cloud. Would you like everyone to be happy? Do you want to own a puppy? 2. Cut them out. Attach all the hands together using a method that depends on where you are going to put them. 3. Cut out the hand and foot. Place the ‘foot/body’– with the toes pointed downwards; the back of the foot is the head. 4. Glue the hand shape onto the foot shape. Place the hand shape where a wing would be in a flying position. 5. Create the dove’s eye using marker or a google eye. Add a beak using brown construction paper or felt. 1. Carefully trace around the right hands of several children—then photocopy handprints onto tag board or heavy paper. Each child should receive six handprints. 2. Provide children with multi-cultural crayons and ask them to color each handprint a different skin tone. After handprints are colored, students may cut them out, cutting carefully between each finger and thumb. 5. Direct youth to copy the phrase onto the handprints, neatly printing one word on each hand. Students may then put the words in order by linking the thumb of one hand between the fingers of the next. You might ask each child to tell one way he or she can love someone else as himself/herself while children are assembling the handprint chains. A simple project can demonstrate the beauty of diversity! Martin Luther King’s dream was to see people of all countries, races, and religions living together in harmony. Gather seeds of different kinds and invite each student to plant a variety of seeds in an egg carton. The seeds of different shapes, sizes, and colors will sprout side by side. Once the plants are large enough, transplant them into a large pot in the classroom or in a small garden outside. If you do this project with some of the school classes, each class in the school might do the project on its own, culminating in the creation of a beautiful, colorful, and diverse schoolwide garden! Source: Richard Ellenburg, Orlando, Florida — Learning Magazine, January 1994. 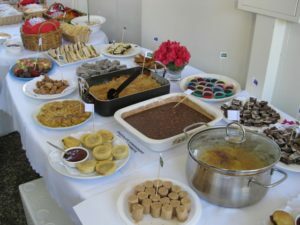 #1…..Have each child bring in a half cup of their FAVORITE SNACK (You can offer parents suggestion at this point: cereal, raisins, crackers, etc) when you get all of the snacks— mix them all in a huge bowl and serve them for snack. Talk about how DIFFERENT THINGS GO TOGETHER to make something very good. This helps get the ideas of diversity, sharing, cooperation, and trying new things across. #2….Do the same as above, however, USE FRUIT instead of snack mixes. Have each child bring in one can… or piece of fruit…and then talk about how different things go together, to make something very good. This helps get the ideas of diversity, sharing, cooperation, and trying new things across. Donate any left-over cans to a shelter! CELEBRATE WITH AN ECLECTIC FOOD FEAST! One of Martin Luther King’s greatest achievements was his ability to help Americans appreciate diversity. Celebrate his birthday with an eclectic holiday dinner featuring cuisine from different countries or geographical regions. Serve Puerto Rican rice-and-beans, Boston clam chowder, a Chinese stir-fry, and a peach pie from Dr. King’s native Atlanta. The variations on this theme are endless, and the dinner doesn’t need to be time-consuming. You can achieve almost the same effect by stopping for TAKEOUT from Kentucky Fried Chicken, Taco Bell, and your local pizza parlor (Italian or Greek). Consider celebrating MLK Day with a ‘SERVICE PROJECT’! As Coretta Scott King said “The greatest birthday gift my husband could receive is if people of all racial and ethnic backgrounds celebrated the holiday by performing individual acts of kindness through service to others.” See the Community Service and Service Ideas on KIdActivities site. DIVERSITY LESSON WITH APPLES AND EGGS..
APPLES: Different colors and all the same inside! Set a red, a yellow, and a green apple on the table. Ask children to name the colors. Cut the apples open and talk about how they have different colors on the outside… but are the same on the inside, just like people. Enjoy the snack! Take a carton of white eggs and a carton of brown eggs. The children will see that the eggs are of different shades and colors. Ask them what they think the insides of the brown eggs look like and what the insides of the white eggs look like. Discuss how people are all different by their appearance on the outside. Then, have a child break open a white egg into a bowl—and another child bread a brown egg in to a separate bowl. The concept is that the eggs may all look different on the outside, but the insides are the same, just like us. Make something with the eggs …enjoy!!! For this activity, divide the class into two or more groups. Some teachers divide students by eye or hair color; some invite students to select and wear badges of different colors (purple, green, and other colors that are not related to skin color); and others isolate students whose first names begin with the letter “b,” (or whichever letter is the most common first letter of students’ names in the class). For a class period or for an entire school day, one group of students (for example, the kids who have blond hair, those wearing orange badges, or the ones whose names start with “b”) are favored above all others. Those students receive special treats or special privileges, and they are complimented often. Students who aren’t in the “favored” group, on the other hand, are ignored, left out of discussions, and otherwise discriminated against. At the end of the period, students discuss their feelings. How did it feel to be treated unfairly, to be discriminated against? Invite students to talk about times when they felt they were judged or treated unfairly. How does this “experiment” relate to the life of Martin Luther King, Jr.? This is A SIMPLIFIED VERSION OF THE ABOVE. While the above is for older youth–THIS WILL WORK FOR PRE-K AND ALL THE WAY UP! Materials: Signs with rules that will be enforced in various room areas/centers. Tell the children that “JUST TO SEE WHAT IT FEELS LIKE” you’re going to “role play” so they can experience what it is like for people who are discriminated against. When the couple hours are over–BE SURE TO HAVE A DE-BRIEFING, where the children meet in small groups to share their feelings and thoughts. THE PREPARATION AND DEBRIEFING IS IMPORTANT!!!! Using rebuses (for children who can’t yet read) Hang or post signs in centers with a picture; put a circle around it with a slash over the entire picture and circle. An example: A picture of a child with “blue eyes” with a circle around it and a slash through it. This means that for the next hour, no one with blue eyes may play in that center. Rotate and change signs. Prepare signs for: Blue eyes, brown hair, long hair, gym shoes, etc. EXPLORE DIVERSITY of the world’s population in general. Talk to kids about the wonderful contributions that people from many different backgrounds make will go a long way to creating caring and compassionate adults who accept people for who they are…. Discuss cultural awareness issues with kids and explore traditions and activities from African and Caribbean countries. Try some of these ideas as a starting point to explore many cultures all year long. Learn about a different country in Africa or the Caribbean. Every member of the program group or a “special club” could research one aspect of the country such as the population, languages spoken and where it is on a map. Younger children could draw a picture or write a story about what one day in a child’s life would be like in that country. Find out how to speak three phrases in the primary language of the country as part of the group project. Research an influential person, such as a politician or inventor, in the movement of black rights in North America. This wonderful display is from the kindergarten class of Renee Glassow. Surround the center photographs/images/posters with handprints and promises the children make. On individual sheets of paper, put each child’s painted or traced handprint. Below the handprint write the child’s pledge. Examples from display: I will use kind words, I will be friends with everyone, I will give hugs and kisses, I will listen and clean up, etc. Said this civil rights leader. Before you begin any activities with the children in celebration of MLK Day…Discuss with children the significance of Martin Luther King Day. YOU CAN SAY SOMETHING such as: Dr. King was treated unfairly when he was a young boy because he was an African American. Back in those days, there were even laws that said that if you were African American, and you had brown skin, you couldn’t sit at the same restaurants as white people and you couldn’t drink from the same water fountains, or anything! We call this kind of attitude prejudice, and it’s NOT OK! When Dr. King grew up, he worked hard to change people’s ideas about race. He wanted people to understand that everyone should be treated equally, regardless of what they looked like. Dr. King wrote one of the most famous speeches in history, called “I Have a Dream.”It talked about his dream that one day in the near future, all people would respect and care for one another. He believed that children will one day live in a nation where they will not be judged by the color of their skin. In January we celebrate Martin Luther King’s Birthday to remember his dream.